It’s with great pleasure to announce that Channels DVR is now available in a Public Beta. Nine months ago we announced that we were going to build a DVR. With a ton of support from you all, one hell of a summer of code, and an amazing Alpha test period, we’re ready to finally say: Holy crap we built a DVR! So what does this mean? It means that anyone (in the US or Canada) can now subscribe to and install Channels DVR. Today’s update to Channels for Apple TV has all of the DVR support built into it. All you need to do is go subscribe, install, and setup Channels DVR. 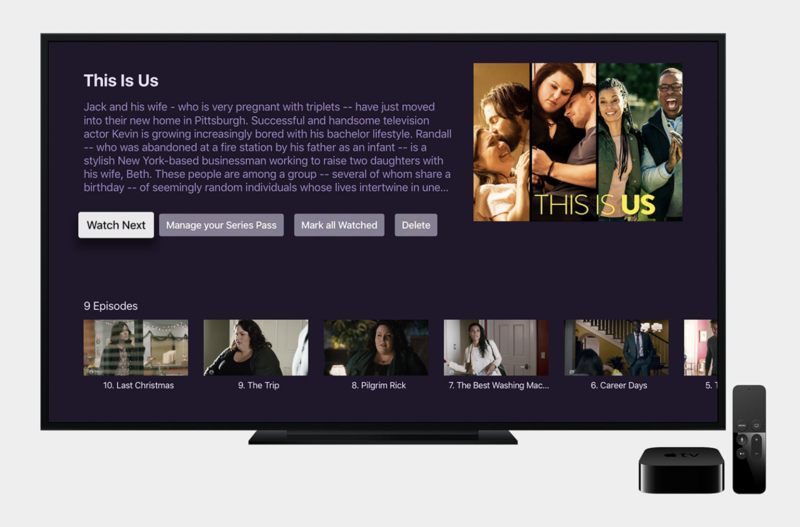 Be sure Channels on your Apple TV has been updated or you won’t see any of the DVR features. We're staring with a Public Beta. So why is this a Public Beta and not just a normal release. Well, while Channels DVR is really feature rich, there’s still a ton of things we think it needs to do before we think it’s a true 1.0. We didn’t want to hide it away any longer. It’s working so well that it doesn’t make sense to not release it. We also know that we can’t get it to be as good as we expect, without feedback from early adopters. It's not good enough yet for us. So you may be asking, why isn't it good enough for a public release? The answer is about what this Public Beta is missing. The first is, iOS support. iOS support will be developed during the Public Beta. We know that Apple TV is where Channels really shines and we purposely avoided DVR integration for iOS so that we could move faster. But don’t fret, iOS support will start trickling out throughout the Public Beta, and it’s going to be awesome. While we’re really happy with how the DVR integration turned out in Channels for Apple TV, there’s still a lot more we want to do. As of now, there’s no real documentation for Channels DVR. This is one of the things we’ll be working on throughout the Public Beta. We hope to expand our region support outside of US/Canada during the Public Beta. We’re excited about being so close to laying down the base of Channels DVR. Once we’re happy with that we can start working on the real features we’re excited about. Stay tuned! So, what does Channels DVR do now? A lot. Series Passes that record all/new episodes for any show. Team Passes that record every game of your favorite teams. Precise retention rules to auto remove recordings. Adjust the padding of recordings to make sure you don’t miss the end of that game. 14 days of guide data. Robust search to find things to record or to create Passes. Fully manageable directly from Channels for Apple TV. Use as many HDHomeRun devices as you want. Prioritize HDHomeRun devices for recording or ignore some completely. Commercial indexing to allow you to quickly skip through commercial breaks. Remote access to your DVR and HDHomeRun devices. Watch live TV or recordings via browser through the Channels DVR web admin. Auto updating. Channels DVR will always be up to date without having to do anything. So how do you run Channels DVR? Channels DVR is a software service that runs in the background on your computer. You can run it on macOS, Windows, Linux, or popular NAS devices. The minimum requirements for the Channels DVR software is a 1GHz CPU and 1GB of RAM. Older NAS models and inexpensive units like the single-drive WDMyCloud are generally too under-powered to run Channels DVR. Some advanced features like commercial indexing and video transcoding will be unavailable on lower end hardware. If you're in the market for a new NAS, we recommend something with a modern Intel CPU. These CPUs have hardware-accelerated video encoders and it is easy to optimize software for them. NAS models like the WD PR4100, QNAP TS-x51+ and Synology DS216+II all use Intel CPUs and offer hardware transcoding. Channels DVR supports the most popular NAS devices right now, with hopefully more support in the future. If you have something that Channels doesn’t run on or aren’t sure if it runs on it, check out the Hardware Category. Feel free to mention an unsupported device or ask the community how well Channels DVR runs on something you have. There’s lot of activity happening in there already. We hope you all have fun with Channels DVR and it works great for you. It’s taken a ton of time and effort to get to this point. We couldn’t have done it without our amazing Alpha testers. Thank you so much. But this is definitely not the end, it’s just the beginning. Keep up with new features added to Channels DVR right here on the Channels Community. Please feel free to discuss issues or neat things you've learned about Channels DVR in the Public Beta category or discuss your hardware setups in the Hardware category here on the Channels Community. Thanks!